Increased levels of damage to livestock have meant pest animal groups are targeting wild dogs as a priority across the region. There are five pest groups within the Watershed Landcare area, these being the Hargraves Hill End Wild Dog Group, Ilford Running Stream Pest Group, Rylstone District Wild Dog Association, Munghorn Wild Dog Group and the newly formed Piambong Yarrabin Pest Group. These groups are volunteer run and strive to support landholders and residents within their areas to manage wild dogs and other pest animals. The Groups, and the Mudgee LLS, are the first point of call if landholders have seen wild dogs or suspect they are suffering from livestock attack or losses. “Communication and reporting are vital.” said Peter Sipek, Chairman of the Munghorn Wild Dog Group. “We all need to know if our neighbours have seen dogs or they are having problems on their place. If we know where they are we can target our control much more effectively.” he continued. 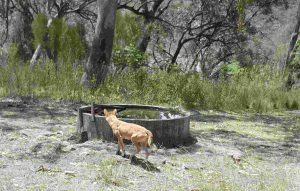 The Munghorn Wild Dog Group’s baiting program will be carried out on Thursday the 30 August and follows on from baiting programs recently carried out in the south and east of the region. Remote cameras are used extensively across the region, providing a valuable tool pre and post baiting. If dogs continue to be seen on these cameras, or mauled livestock are reported after a landholder has been involved in a baiting program, then sending a trapper to the area can also be considered. Wild dog detected on a remote camera in the upper Bylong area. Watershed Landcare Pest Animal Group Coordinator Beth Greenfield can be contacted for more information on 0438 090 525 or by email beth.greenfield@watershedlandcare.com.au. The latest trend in top Sydney restaurants is weeds. Farmers friends, purslane, salsify, wild asparagus and nettle are all on the menu and chefs are willing to pay top dollar. One man is on a mission to connect farmers, landholders and budding foragers from the Central Tablelands to the catering and restaurant industry of Sydney. After many years working as a foraging educator Diego Bonetto has established Wildfood Store, a marketplace for edible wild food. 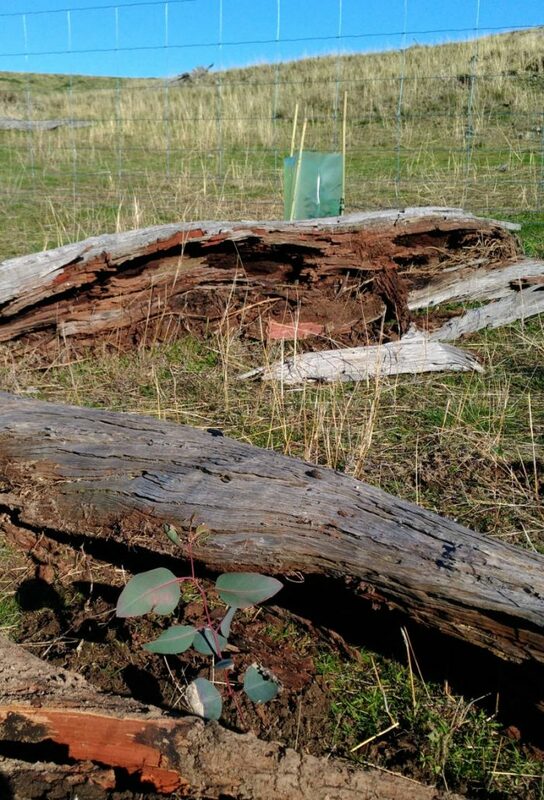 The platform and registered company will offer farmers and people in regional NSW the opportunity to subsidise their income by harvesting desirable edible wild plants. “There is an unrelenting request form the city’s fine dining industry for well presented, clean, atypical edible species.” said Diego. For example young, good quality tips of farmers friends can fetch $7-8 for a 100 g punnet. “Farmers have edible weeds growing all over so it is just a matter to train people how to harvest and package and get the produce to the city.” he continued. Diego has secured some seed funding from the NSW Government via an initiative in collaboration with the Kandos School Of Cultural Adaptation. The concept is simple. Chefs in the city want clean, well-presented and fresh wild edibles. Diego will train farmers on how to harvest and package the produce and via a distribution company in the city deliver them to the top restaurants in Sydney. The farmers get paid for their efforts and Diego will bring their stories to the city’s tables. 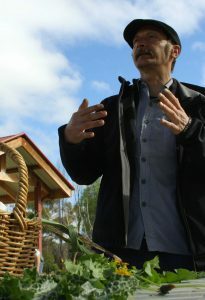 Diego will be running a Foragers Training Workshop in Kandos on Saturday, 11 August from 10am-12:30 pm. Diego Bonneto will provide training on how to harvest and package desirable wild plants and get the produce to the city. Diego Bonetto is an Italian artist, father, forager, speaker, keen naturalist and award winning cultural worker based in Sydney. Diego works with chefs, scientists, architects, academics, herbalists, brewers, soap makers, producers, educators and land owners, providing programs, workshops, tours, community engagement strategies and exhibitions. You can read more about Diego on his website: http://www.diegobonetto.com. Attendance to the workshop is $10, visit https://www.diegobonetto.com/shop/mid-western-foragers-training-aug11 to book your spot. Can’t make the workshop? Diego will also be available to conduct consultation visits to local properties to identify wild food produce potential during the week of August 6 to 10. Contact Diego on 0411 293 178 or info@diegobonetto.com for more information. As consumers become increasingly interested in where and how their food and fibre are produced, more and more farmers and producers are turning to direct marketing to sell their wares. But how do you tell your story in the right way to the right people? Join us for a ‘Visual Storytelling – the art of capturing the right attention’ workshop on Sunday, 1 July and learn how you can use social media to convert your customers into a community. Watershed Landcare have invited Sophie Hansen, founder and creator of Local is Lovely and My Open Kitchen and 2016 National Rural Woman of the Year, and Annie Herron, painter, sculptor and art teacher who has taught art to all ages for over 40 years and has been exhibiting for 30 years, to present the workshop. Social media is a visual medium and so great photos are an important part of your storytelling. In this three-hour workshop we will run through how to compose, capture, caption and share images that tell your story in the most engaging way possible. Creative Afternoon: 2016 National Rural Woman of the Year, Sophie Hansen, will present the Visual Storytelling workshop. We will cover the basics of composing engaging images, how to shoot them on your smartphone (or camera if you prefer) and how to edit them so they really pop. Then we’ll move on to the words – how to write and edit captions that tell a story, that engage and motivate your customers so they become community members and your biggest advocates. This will be a lovely afternoon of creativity, strategy and figuring out how to tell your story in the right way to the right people. The Visual Storytelling workshop will be held from 12 noon to 4pm on Sunday, 1 July at Augustine Function Centre, 50 George Campbell Drive, Mudgee. All welcome, the workshop is free to attend with lunch provided but please RSVP by Tuesday, 26 June as numbers are strictly limited. For more information or to RSVP contact Watershed Landcare Coordinator, Claudia Wythes, on 0412 011 064 or email: claudia.wythes@watershedlandcare.com.au. This event is supported by Watershed Landcare through funding from the Central Tablelands LLS from NSW Catchment Action and the Australian Government’s National Landcare Programme and is a part of the NSW Government’s Local Landcare Coordinators Initiative, supported through the partnership of Local Land Services and Landcare NSW. Ever wanted to grow your own native plants? Do you know how to tell a healthy, viable seed from an unhealthy one, when is the best time to sow, and how to give your newly emerged seedlings the best conditions to ensure success? Watershed Landcare will be hosting a seed collection and propagation workshop on Sunday 6 May and have invited local ecologist, David Allworth, and local botanist, Christine McRae, to share their extensive knowledge on the subject. 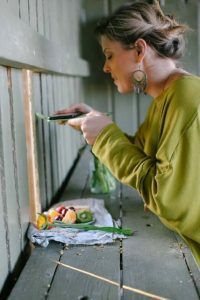 “Collecting your own seed and growing the plants yourself for either re-vegetation projects, farm windbreaks and shade trees, or the home garden can be extremely satisfying. The ultimate DIY project that will outlast a lifetime.” said Ms McRae. “The purchase of seed to grow native plants is relatively low cost. However, collecting your own seed from close proximity to where it will be used can add to the survival rate of the plants.” she continued. The reason for this is that local plants are more suited to the local environment. They would have evolved over time to cope with environmental variables such as rainfall patterns, frosts, winter and summer extremes, soil types and landscape position. Provenance is a term meant to describe the origin of a seed source. Local provenance equates to genetic adaptation to local environmental conditions. “Another good reason to collect your own seeds is that there are many native plant species out there and commercial suppliers will not be able to supply everything when required, if at all. Growing your own local native species is the best way to aid their survival.” said Ms McRae. The workshop will cover basic identification features of some commonly found local plant species; why collecting locally is best; safety, permission, timing, methods, storing collected material; equipment and processing of collected material; methods and materials for propagation and the best time to sow seed. Workshop participants with gain knowledge and skills to select for viable seed, ensure successful germination and give seedlings the best start. The seed collection and propagation workshop will be held from 9am to 12 noon on Sunday 6 May at the Straw Bale Shed, AREC. The workshop is free to attend with morning tea and lunch provided. All welcome. For more information or to book your spot please contact Agness Knapik, Watershed Landcare Coordinator, on 0435 055 493 or info@watershedlandcare.com.au. This event is supported by Watershed Landcare through funding from Michael King and Landcare Australia. The bees have been busy this spring, with a large number of swarms appearing across our district they have also been keeping members of the Mudgee Bee Group busy. “Mudgee has been the hot spot this spring; the Mudgee Bee Group has collected at least 8 swarms around town, as well as a couple at Gulgong.” said Mudgee Bee Group swarm co-ordinator, Sandi Munro. “The public have alerted us to several swarms, via our Facebook page and through the Amateur Beekeepers Association swarm collectors list.” she continued. 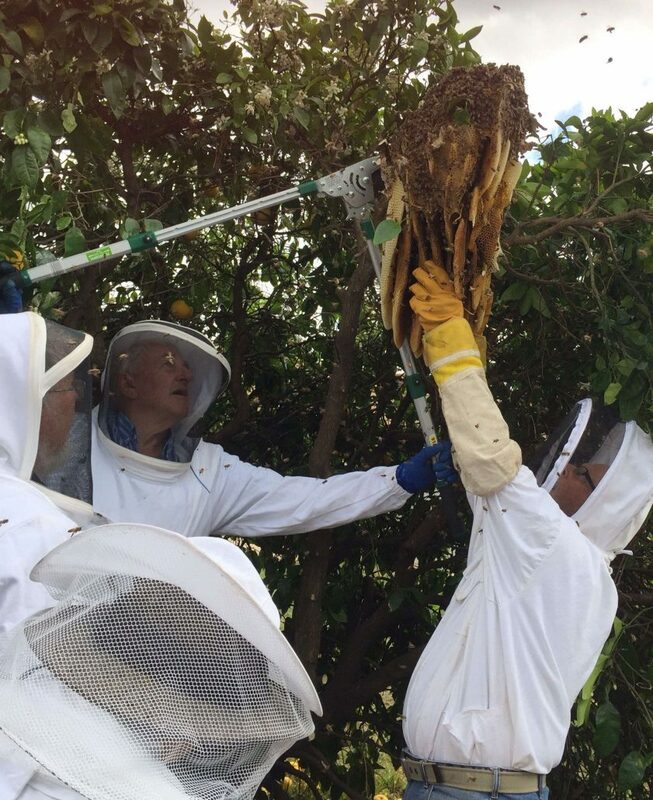 The Mudgee Bee Group removing a large swarm from a grapefruit tree in Gulgong. Swarming is the way bees increase their population. Swarms can be spectacular when you see them flying over and settling to rest somewhere. Usually bees are at their calmest when swarming, but not always! “Swarms are exciting to see, and usually easy to remove, from a branch or letter box, but if they move into your chimney or eaves of the house, they are a lot more difficult to remove, so let us know as soon as you spot them, the sooner the better!” said Ms Munro. Mudgee Bee Group have a swarm co-ordinator that can assist with information or removal of a swarm, contact Sandi Munro on 0487 898 404. Spring is when the bees do their most important work; pollinating trees, crops and flowers and, of course, making honey! To help the bees this spring there are a few things you can do. Bees use up to 5 litres of water a day per hive during hot weather to quench their thirst, and to keep the hive at a constant temperature for the brood to be healthy. In dry times you can help by putting water out for them. Bees can’t swim, so add some sticks, pebbles or corks to the bird bath to help them get out if they fall in. Don’t use chemical sprays, especially on blooms. Spraying blooming flowers, trees, shrubs and lawns can kill bees! Even some deemed safe for humans are detrimental to bees. Even ‘safe’ sprays leave a residue that is picked up by bees in both nectar and pollen and can then end up in your honey. Plant a bee garden – bees need food and most flowering plants give some benefit to bees by way of pollen and nectar. Borage, lavender and rosemary are easy to grow and very popular with bees. Annuals, perennials, trees and shrubs can all be planted to benefit bees. If you would like to learn more about bees, come along to a Mudgee Bee Group meeting or find us on Facebook (www.facebook.com/Mudgeebeegroup). For more information contact Claudia Wythes, Watershed Landcare Coordinator, on 0412 011 064 or claudiawythes@watershedlandcare.com.au. 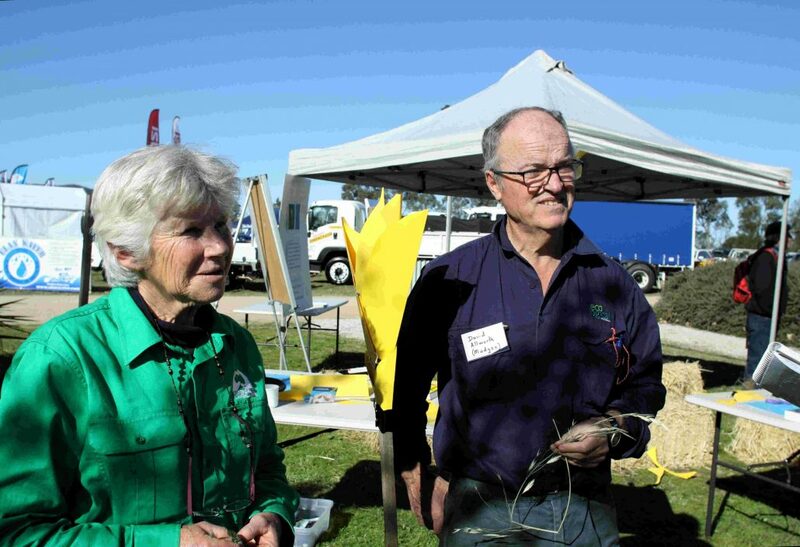 The Mudgee Bee Group is supported by Watershed Landcare and the Amateur Beekeepers Association and is a part of the NSW Government’s Local Landcare Coordinators Initiative, supported through the partnership of Local Land Services and Landcare NSW. Australian is a land of climatic extremes. Farmers and land managers contend with cycles of flood and drought punctuated by the odd ‘good’ year. While we rarely complain about there being too much water, we do spend a lot of time wishing for rain. But what if you could capture that water and keep it in the landscape, and on your farm, for longer? Watershed Landcare will be hosting a Rehydrating the Landscape workshop in November. 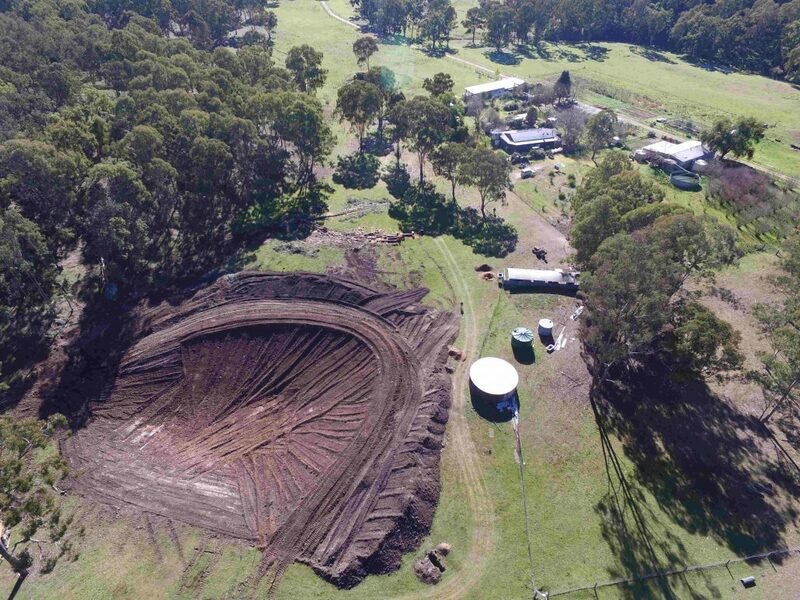 The workshop will be presented by Dan and Nicki Power who have constructed a system of dams and swales on their farm to rehydrate the landscape, and regenerate degraded soils and create an edible landscape at the same time. Dan and Nicki will discuss what our farms would look like if they were rehydrated, what influence we have as land managers in the amount of water that stays on our farm, and what interventions we can make, from small to large, to increase our influence. They will cover the principles of rehydrating the landscape as well as showing examples of successful rehydration interventions. Sign of things to come: Construction of a dam which, together with a system of swales, will rehydrate the landscape. We will also go for a walk around the farm to see what’s been achieved, the particular issues faced and discuss the next steps. Adon Bender, the farm rehydration adviser, and Mark Anderson, the dam builder, will also be on hand to provide explanations and answer questions. The workshop will be held on on Saturday, 4 November from 9am to 4pm at Hazelcombe Farm, Totnes Valley (40 mins from Mudgee). Attendance is free for Watershed Landcare members and $10 for non-members. Please wear work clothes and covered footwear and bring hats, sunscreen and drinking water. For further information or to RSVP contact Agness Knapik, Watershed Landcare Coordinator, on 0435 055 493 or by email: info@watershedlandcare.com.au. Got a bushfire plan for your property? With the recent rain experienced in our district the immediacy of bushfire risk has passed. But if you’d had a fire at your place would you have been prepared? This year saw a late but active fire season in our region with a number of severe events experienced, such as the Sir Ivan fire. With more than 55,000 ha burnt the property and stock losses were devastating. However, no human lives were lost and this has been put down to people having, and acting on, their bushfire plans. Do you know who your local Rural Fire Service (RFS) brigade is? Have you got a plan for you family, pets and livestock in the event of a fire? Are you adequately insured? Are your business records backed up off-site? There’s a lot to consider in the preparation of a bushfire plan and it may seem daunting, so Watershed Landcare will be hosting a workshop next Thursday to help you work through the process. The Bushfire Planning workshop will be held on Thursday 30 March in the Lecture Room, Small Pavilion, Australian Rural Education Centre (Opposite the AREC office). We will commence at 9:30am and aim to finish by 12:30pm. We have invited Jayne Leary from the RFS to facilitate the workshop and walk us through the planning process. We will also be joined by Brett Littler (Livestock Officer) and Nigel Gillan (District Vet) from Central Tablelands LLS who will discuss considerations for livestock in bushfire planning. They will also share their experiences from the recent Sir Ivan fire. Nigel will also cover companion animals. This will be a hands-on workshop with plenty of opportunity to ask questions and bounce ideas off others. The intention is that you will walk away with a bushfire plan for your property, or at least a draft. The workshop is free and everyone is welcome, you don’t have to be a member. So please bring along your family and tell your friends and neighbours. If you would like to attend please RSVP by Monday 27 March. For more information or to register your interest please contact Agness Knapik, Watershed Landcare Coordinator, on 0435 055 493 or by email: info@watershedlandcare.com.au. This event is supported by Watershed Landcare and is a part of the NSW Government’s Local Landcare Coordinators Initiative, supported through the partnership of Local Land Services and Landcare NSW. Watershed Landcare would like to acknowledge support from AREC. http://watershedlandcare.com.au/wp-content/uploads/2017/04/bushfire_survival_plan.jpg 210 350 wslc http://watershedlandcare.com.au/wp-content/uploads/2016/12/logo-watershed-300x104.png wslc2017-03-24 14:12:552017-04-03 14:13:27Got a bushfire plan for your property?